Teachers are regarded as the best employees on the plant. They are the building blocks of just about every learner’s success. At one point in time, they contributed to who we are today. But, how can public and private schools be sure that they have the right employees in their learning institution? Well, the only best way to find out is to conduct an evaluation. With the right tool and the willingness to conduct the evaluation, it should not take you long to complete the Evaluation Forms. To find out just how well a teacher has been teaching a certain subject, it would be best if you evaluated him or her based on their teaching criteria. Doing this will enable you to know whether students are getting the value of their money. 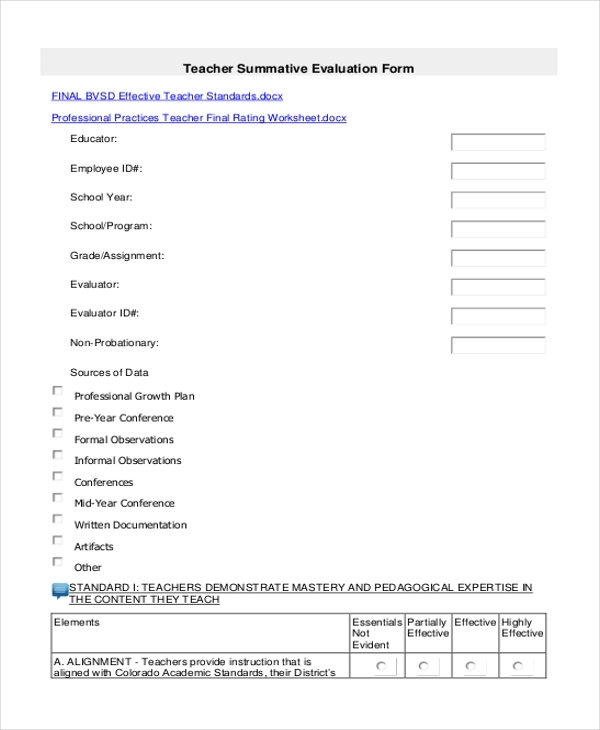 You may also see Teacher Evaluation Forms. Some schools decide to use observation skills to evaluate their teaching staff. If this is how you do things in your school, it would be best if you download and use the following sample file. The document is free to download. 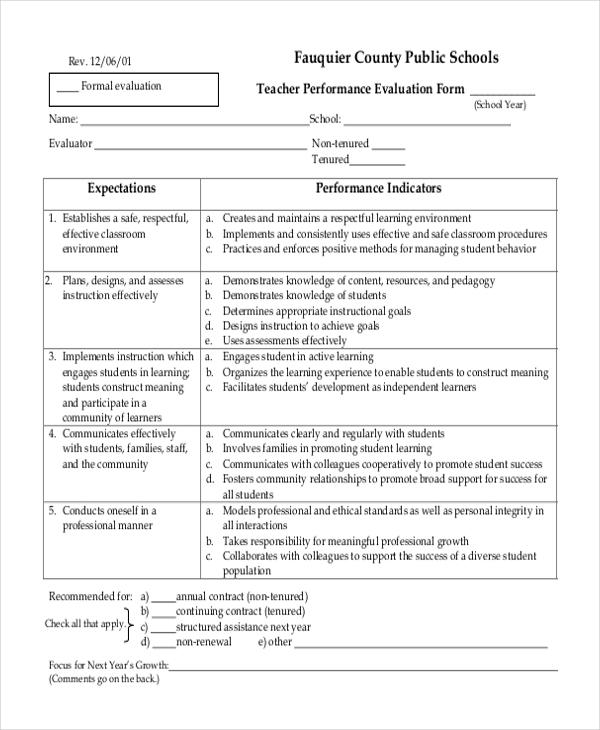 Teacher evaluation is an important task. You need to conduct the activity at least once every three months. The purpose of the evaluation is to find out whether the teachers that you hired a competent to provide high quality education to students. After conducting an evaluation, the best thing to do would be to write an evaluation report. You can keep the report for future reference. It is important to share the results of the finding with the individual teacher in question. You can also see Training Evaluation Forms. Do you know that asking parents to grade the teachers in your school can help to determine whether you hired the right staff? 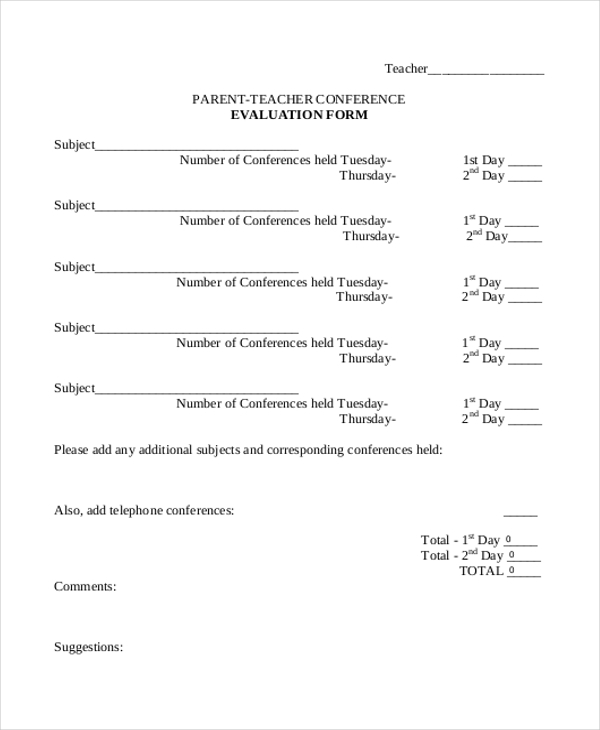 The best thing to do is to download the Parent Teacher Conference evaluation forms and use them accordingly. It is important to hire the right teachers. The education of students is, of course, so much important. But how do you know you hired the right staff? Well, the best thing to do is to use the following forms to conduct the evaluation. How teachers handle little children in school will determine the growth of those kids. It is important to make sure that these young ones are getting the best education. 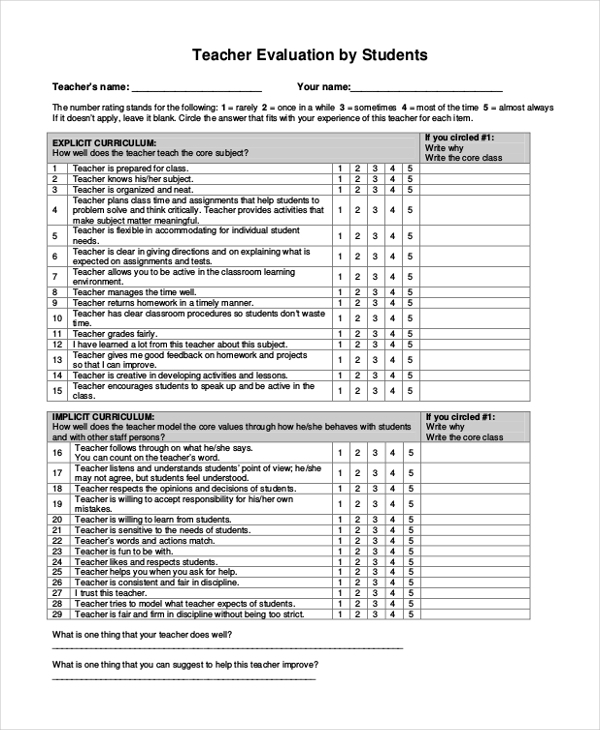 And, an evaluation for teachers can help you assign the right teachers to the kids. 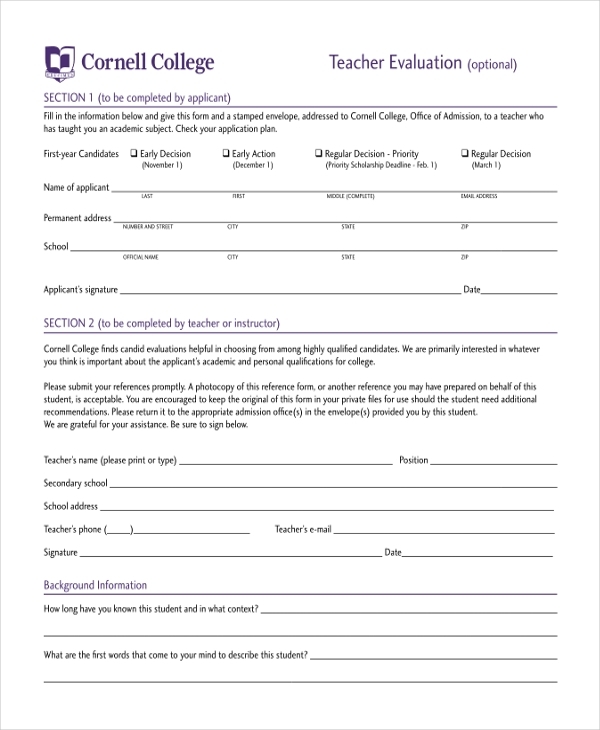 You can also see School Evaluation Forms. The performance of a teaching staff is something you cannot possibly ignore. You need to do the best you can to conduct an evaluation from time to time. Here is a sample file that can be of great help for the evaluation process. Do you know that you can now evaluate the performance of the teachers in your school at least every month? 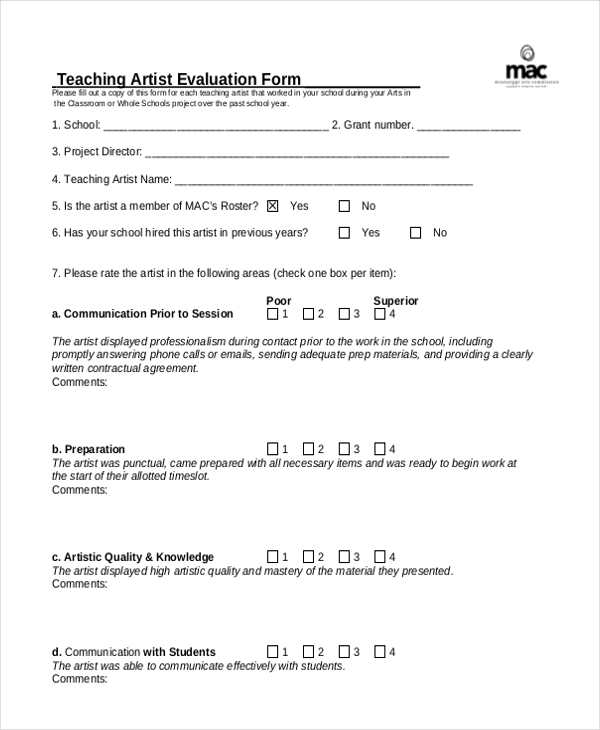 All you have to do is to download and use the following form for the evaluation process. At the en do of the day, you need to make sure that students are getting the right education at the right time. That means you have to evaluate your teaching staff to determine whether they are competent or otherwise. Use the following sample template. Yes, you can create your own evaluation forms. But, that is going to take a lot of your time. 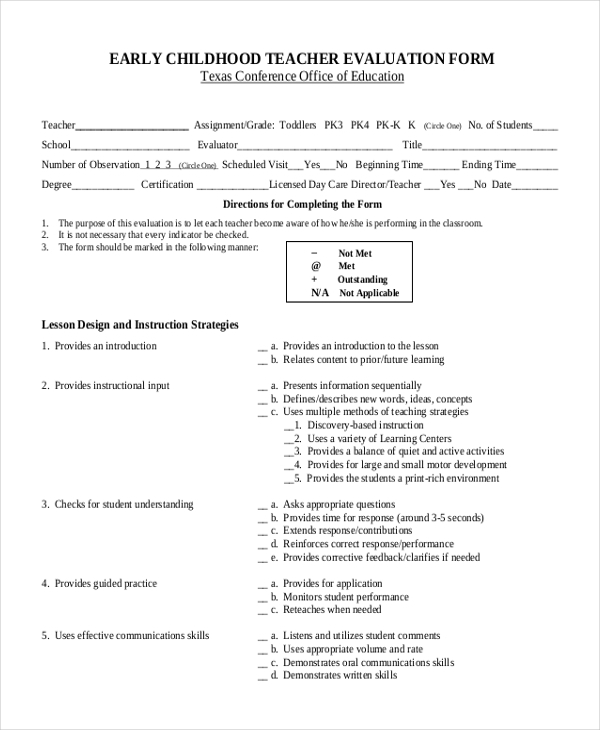 The best thing to do is to download a free template and then use it for the evaluation process. Here is a free template. When we talk about downloading teacher evaluation for free, we usually mean at least three things. First, it means that the files designed and made available for download are always free to download. In fact, you never have to spend any minute on your computer to get the job done. It has already been done for you. Secondly, it means you won’t have to hire someone out there to do it for you. Before the creation of evaluation templates, you’d have to ask someone to create these forms, but now you don’t have to because they are available for free, hence, saving you time. Lastly, it means completing the evaluation process fast. 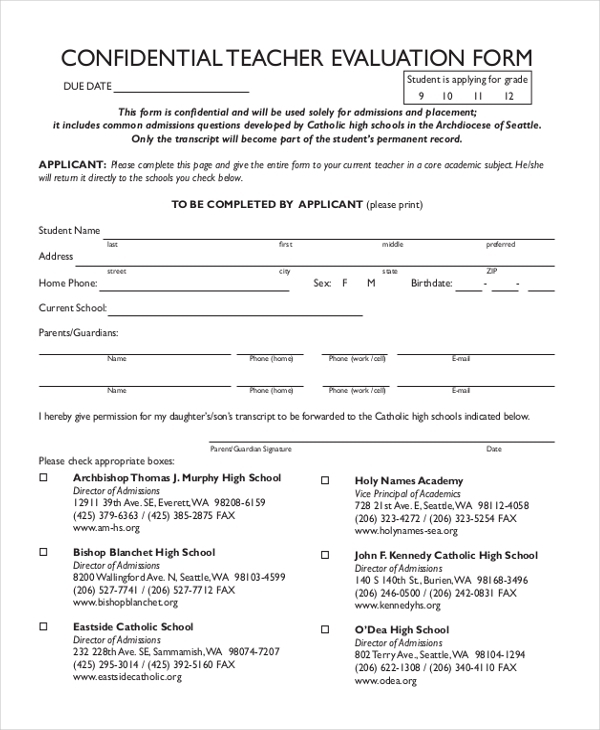 You may also see Employee Evaluation Forms. Evaluating a teacher helps you to determine whether you hired the right staff for your organization. Every form in this thread is structured in a way that can help you gauge the performance, abilities, and skills of a teaching staff, making it easy for you to know their productivity level as well as the areas of weaknesses. It is important to keep in mind that the purpose of the evaluation is not to fish out the underperforming employees. Rather, it should be to analyze the effectiveness of each employee at the place of work and to provide necessary training to those not performing well. 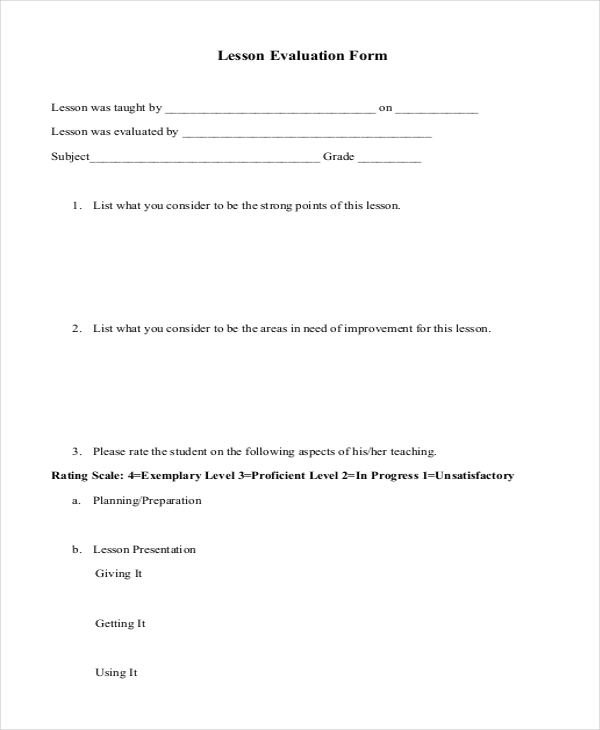 You can also see Peer Evaluation Forms. 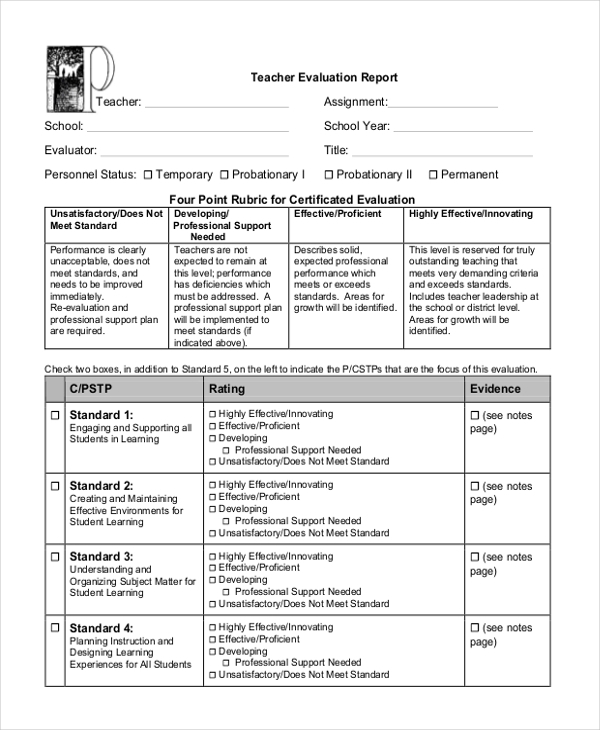 Teacher evaluation is not a one-time task. Of course, the assessment process is an assignment that you will continue to do as long as your school exists. As such, you should consider using sample forms to make work easier, particularly if you are going to be doing this every month.